The Moon Palace is just one property where Mark Travel’s Funjet Vacations offers incentives to agents. If your idea of an amazing sale involves great bargains on tropical getaways instead of door-buster discounts on electronic gadgets, this is the promotion you’ve been dreaming about. Palace Resorts, a brand that has become synonymous with elite, all-inclusive resort accommodations, is offering Cyber Monday deals of up to 50 percent off at the brand’s eight award-winning oceanfront properties. For those unfamiliar, Cyber Monday is the online evolution of Black Friday, that phenomenon in which bargain-hungry shoppers swarm stores the day after Thanksgiving in hopes of scoring amazing deals retailers offer as a way to kick off the holiday shopping season. One advantage of Cyber Monday is that deals can be procured via the convenience of your computer or other electronic device, from the comfort of your own home or wherever you happen to be. But let’s get back to the deals. If you have been longing for a getaway to a warm-weather paradise, this is a sale custom-designed with your shopping list in mind. 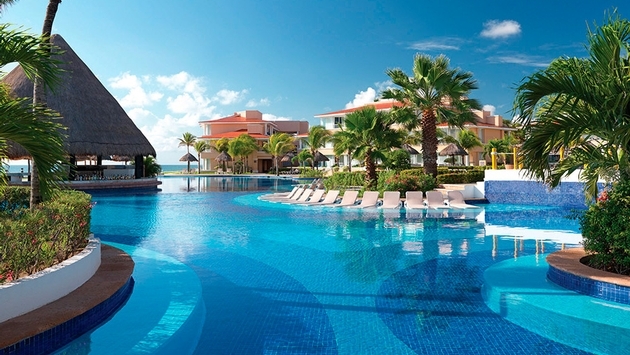 You can get up to 50 percent off rates for travel to Moon Palace Cancun in Cancun, Mexico, and Moon Palace Jamaica Grande in Ocho Rios, Jamaica. Notable as the brand’s top entertainment destinations, both resorts provide lots of entertainment options, or you can always just immerse yourself in the sizzling sun. If a more mature destination better suits your style, snag bargains of up to 45 percent off rates at Le Blanc Spa Resort, an adults-only property in Cancun, Mexico. Enjoy romance or relaxation at this property that specializes in personalized service for guests with demanding taste. Or you can opt for savings of up to 45 percent off rates for bookings at a number of other resorts. Your options include Beach Palace in Cancun, Mexico, Playacar Palace in Playa del Carmen, and Cozumel Palace in the island of Cozumel. You can also get similar savings at the adults-only properties Sun Palace in Cancun and Isla Mujeres Palace in Isla Mujeres, Mexico. As with any amazing deals, you have to act fast to get the rewards. Take advantage of these Cyber Monday sales by booking your stay online between November 28 and November 30. Discounts apply for travel November 28, 2016, through December 23, 2017. You must book a stay of three nights or more. Offer applies to new bookings only, and cannot be combined with any other existing offer. Restrictions and blackout dates apply. The best part is that while your bill may be downsized, your vacation will still be stuffed with all of the excitement and adventure you imagine in a dream escape. You don’t need to sacrifice a single thing in order to enjoy this significant savings. You can count on getting the same top-notch service and unforgettable experience you can always expect when you visit a Palace Resorts property. Treat yourself or a loved one to a little bit of tropical paradise this holiday season. Rely upon the brand known for setting the highest standards in all-inclusive resorts in Mexico and Jamaica. Be sure to take advantage of the Cyber Monday promotion through Palace Resorts.